The head of Spain’s leftwing Podemos party, Pablo Iglesias, has said he will visit the former Catalan vice president, Oriol Junqueras, in prison on Friday to try to gain his party’s support in passing the 2019 budget. On Tuesday, a year since the first political leaders were remanded in custody, Iglesias said he will visit Junqueras, the head of the Esquerra, ‘as soon as possible’. 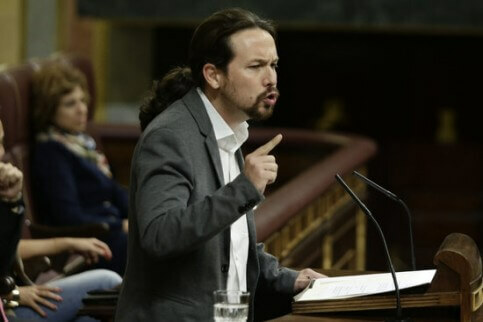 ‘I’m convinced a left-wing party will not stand in the way of Catalans getting a 900-euro minimum wage, more resources for dependents, or protection for tenants,’ said Iglesias. Spain’s minority Socialist government came to an agreement with Podemos to help pass the budget, but it still needs the votes of pro-independence parties, such as Esquerra. Talking about his impending visit, Iglesias said, ‘it’s normal and healthy that we meet and it’s exceptional that he’s in prison, he shouldn’t be there, but I have no problem meeting him there’. Meanwhile, Carles Campuzano, the spokesman for the PDeCAT party, Esquerra’s pro-independence ally in the Catalan government, urged Iglesias to also visit the jailed former ministers who are members of his party.